Students have one hour of RE per week at KS3; in which they have the opportunity to explore their own beliefs as well as the beliefs of others. One of the primary aims of the subject is to allow students to enhance their Social, Moral, Spiritual and Cultural development by learning about and from religion. 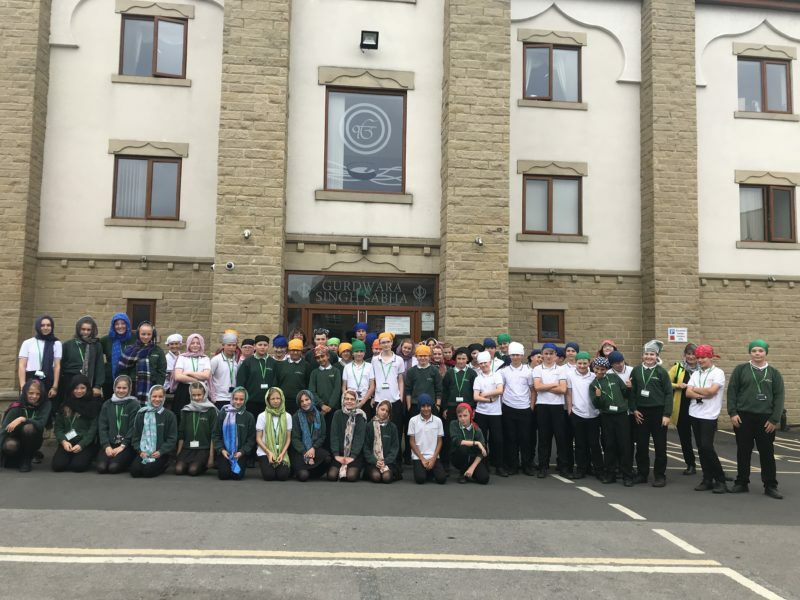 Mutual respect for one another, as well as tolerance of different faiths and cultures underpins the learning journey in Religious Education lessons at Upper Wharfedale School. This unit topic focusses on charitable giving in Christianity, including the Beatitudes and Christian inspirations. The end of unit assessment involves groups working to create their own charity, incorporating Christian teachings learnt throughout the unit. Why are the 5 pillars of Islam important to Muslims? This unit looks at the core foundations of belief within Islam, and their importance to Muslims today. Students are given the opportunity to develop their understanding of the religion, with plenty of opportunities for discussion and asking questions. This unit looks at the history of Sikhism, and how it is followed by Sikhs today (including the importance of the 5K’s, the Langar and the Guru Granth Sahib). The learning is further enhanced with the opportunity to visit a Gurdwara at the end of year 7. Year 8: Students focus on Christianity as well as non-religious beliefs. The unit starts with analysing art work from the NATRE competition, showing how others have creatively expressed their beliefs about God. Atheist, Theist and Agnostic views are explored; before students are given the opportunity to create their own art work from the yearly themes provided by the National NATRE competition. How much do beliefs make a difference? This unit examines the life of St Francis, and how his beliefs impacted his life. Students are given the opportunity to examine how their own beliefs and values impact their lives, and to compare these with the beliefs of others (including religious and non-religious beliefs). Students are given the opportunity to critically analyse whether the Bible is relevant today, with a focus on The 10 Commandments, The Parable of the Good Samaritan and The Parable of the Rich Farmer. We look at a wide variety of beliefs about life after death, and students are given the opportunity to explore what they believe. From the Mexican Day of the Dead, The Hindu Caste system (and how that impacts beliefs about the afterlife), to Christian, Muslim and non-religious beliefs. This unit covers a wide variety of topics, from the importance of marriage in Christianity to family life, contraception, homosexuality and divorce. Muslim beliefs are explored as well as Christian, with a view to prepare students for the GCSE. The course (Edexcel specification B) is run over two years and is broken down into 2 exams which are taken at the end of the course. KS3: Work is assessed in a variety of ways. Presentations (in groups or individually), written assessments or creative pieces of work are used to get an accurate assessment of whether students are on target. KS4: Internally marked exam questions (under assessment conditions) are undertaken at the end of every unit, and at midway points within the unit. Additionally there will be a written mock exam at the end of year 10, and additionally midway through year 11. KS3: Termly homework – as a themed project homework (e.g create a prayer mat in year 7) or a weekly set piece to be completed for the following lesson. KS4: Exam questions or research homework is set regularly. Students have the opportunity to enter the Spirited Arts competition run by NATRE in Year 8.